Shell seeking is one of the most beloved activities vacationers take part in every summer on Edisto Beach, but theres one place on the island that is a must-see for any seashell lover. Shell Island is the nickname given to a sandbar island just across from Jeremys Inlet. This area can be seen by walking down the section of the beach in front of the beach campground of the South Carolina State Park. During low tide, it seems possible to walk across the inlet and onto the island, but the currents are very strong and the tide changes quickly making it possible to get stranded on the island. A better way to get to the island is to call Edisto native Captain Ron Elliott at (843) 869-1937. Capt. Ron will take shell seekers out on a boat and leave them on the island for about two hours. Once on the island, visitors will be pleasantly surprised by the amount of shells scattered on the island. Many of the shells are bleached from years of direct sunlight that shines down and whitens the sand of the island. Several shells are in excellent condition making it possible to bring home some natural souvenirs from an Edisto vacation. 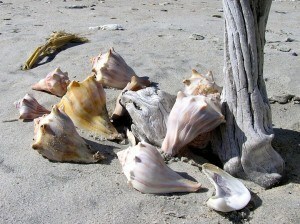 Shells on the island include the butterfly-shaped Angelwings, slender Wentletraps, spiny Apple murexes, scalloped calicos and cockles, Atlantic Jacknives, Slippersnails, Surfcalms, and Wing Oysters, Banded Tulips, Whelks, Channeled Duckclams, Wentletraps, and more. Its also possible to find hermit crabs scuttling about over shells and in the sand, but they generally prefer to be left alone. Other treasures on Shell Island include sharks teeth, horseshoe crab shells, sun-bleached driftwood, sand dollars, starfish, sea glass, and fossils. Loggerhead turtle nests also dot the land, but are not to be disturbed. Although it is possible to swim in the water off Shell Island, the undertow is slightly stronger than the undertow off of front beach, so swimmers are urged to take safety measures before entering the water. Its also likely that small sand sharks are in the water (along with dolphin, turtles, jellyfish, and a host of other sea creatures) so always be on the lookout. No trip to Edisto is complete without a visit to Shell Island at least once to see all the hidden treasures of the area. GETTING TO CAPTAIN RONS: Once an appointment has been made to go to Shell Island, visitors can get to Capt. Rons by taking Botany Bay Road past the AME church and follow the road until it dead ends. A sign for his eco-tours will be visible from the road. @Stan I made this walk on three separate days. I'll bet you did not look at the tide charts because the water can be ankle deep at true low tide and at high tide the island is under water. I am not a power walker but I did say it was a mile and a quarter one way and as I said before walking in the soft sand is tough. You have to walk at the waters edge on the hard sand. If you have not looked at the tide charts to plan your trip you are wasting your time. What I said is true, just because you can't plan and have trouble walking don't blame it on me. WORST ADVICE EVER! Don't listen to this Bob guy. I took my wife on this trek to shell island and it was a complete disaster. He must be a power walker to make this trip in 30 minutes. Took us closer to an hour an a half one way! We finally get to to this inlet that's "knee deep" and its more like a raging river. She's still mad at me over the whole thing. I almost forgot. Be sure to take some type of beach shoe; crocs, flip flops or water shoes. There are a lot of places on the island that are nothing but shells. You can walk from the State Park beach. If not staying there you will have to pay to enter and park your car. That is as close as you can get other than by boat. The other end is a private gated area you cannot drive through and the middle is all salt marsh. The walk is about 1 1/4 miles one way and takes about 30 minutes at a moderate pace. If you walk down along the waters edge where the sand is hard it is an easy walk but up in the soft sand at high tide it can be tough. I would leave about an hour or more before low tide. When you get there people will already be looking and picking up the best shells. About an hour or so before low tide you will be walking through about knee deep water to get on the island but at true low tide you can cross in ankle deep water. Make sure you take something you can carry heavy shells in like a big bag with a shoulder strap, sunblock and a bottle of half frozen water. I tried to take my family on a trip to shell island recently only to find this Captain Ron person no longer runs the landing at the end of Botany Bay Road. Captain Mike however does, and he took us out for a great day on shell island. The place is now called Wilkinson's Landing. 843-609-7102. We made our reservations online wilkinsonslanding.com. We never got to go out with Captain Ron, but Captain Mike was great!